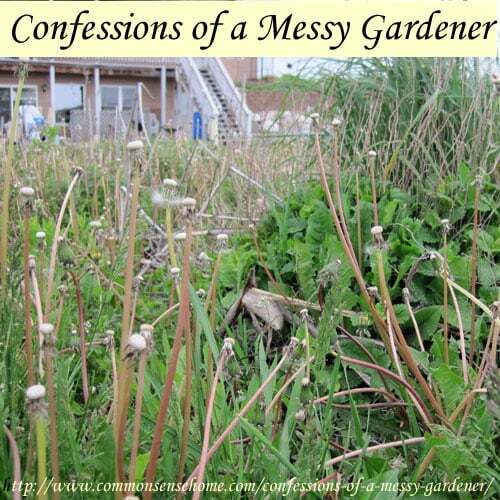 Alright…I'm fessing up… I'm a messy gardener. That “thicket” you see in the photo above is one of my garden beds. It's true, in a couple of weeks it'll look very different, but right now much of the garden is wildly overgrown. In this particular case, we've got a lovely harvest of dandelions, a patch of lemon balm on the right with a big clump of grass in it, cornstalks, catnip and a few dozen other prolific weeds. It'd be enough to make the editors of Better Homes and Gardens have a heart attack. Am I freaking out about this? Not really. Here's why. In an ideal world, I'd have a clone or personal assistant, and we could magically stretch our 24 hour days to accomplish everything on my to-do list. In this world, not so much. Since I have yet to see anyone stop by just to clean my house or weed my garden, it'll have to wait until I get to it. Abundant weeds means no weed killers. RoundUp and other chemical weedkillers are some seriously toxic garbage that have been linked to birth defects and a variety of other health problems for animals and people. I was talking to my dentist a couple of years ago, and he was explaining how he applied RoundUp to his garden every couple of years to knock out the weeds. Nice guy, but I think all the mercury may be getting to him. My topsoil is protected and teeming with life. We've got a LOT of wind around here. I don't like to till my beds in fall, even though it means I can work them earlier in spring, because I can see by the brown snow in winter how much topsoil blows off of tilled fields. As we've been working our beds this spring, they're loaded with earthworms, night crawlers, pill bugs, sow bugs, centipedes millipedes and every other sort of creepy crawly. If you've got bare soil, those critters have no protection. This may be helpful if you're trying to purge some pests, but in general I don't recommend it. All those little critters work to break down organic residue and incorporate it into the soil. They also aerate the soil with their tunneling. If I was more tidy, I'd grow more cover crops, but with the jumbled mass that is my garden, I never seem to have an area completely cleared in time to grow a proper cover crop in fall. The weeds are my cover crop. Sometimes pleasant things show up when I don't expect them. 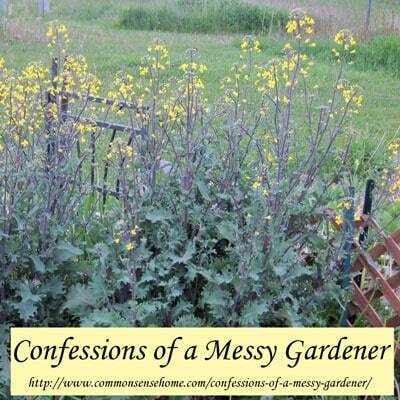 I left my Red Russian kale in the garden last fall to harvest into the winter. Since we had an unusually mild winter, many of the plants survived through until spring (which has never happened before). Right now, they are flowering like crazy. These, along with the weedy wildflowers, will help hold the pollinators over until the bulk of the garden is in flower. Since there are several plants, they should be able to produce viable seed. The weeds act as wind blocks, shade and protection. In some of my perennial beds, the weeds are generally sprouting out ahead of the perennials. This year, we've had some big temperature swings, lots of wind and unseasonably warm weather followed by cold. The weeds take the bulk of the temperature swings, leaving the planted perennials protected. Now that the temps have settled out, I can safely remove the weeds and the perennials will take off. Much cruder than those fancy cone things most people use, but it works. This sort of laissez-faire gardening approach used to drive my suburban neighbors nuts, even after I got things tidied up considerably, so I don't necessarily recommend it if you've got fussy neighbors. Around here, folks are much more tolerant, and they appreciate the bountiful harvest that comes out of my “mess”. Sometimes I get a little frustrated because I feel “behind”, but as one facebook fan pointed out, it's better to consider how much ahead you are of those who don't plant anything. Embrace the mess! I'm heading out to my overgrown garden now. 🙂 The mower died last week, so the the lawn matches the garden – yikes! The boys are picking it up today and we should be back in action shortly. 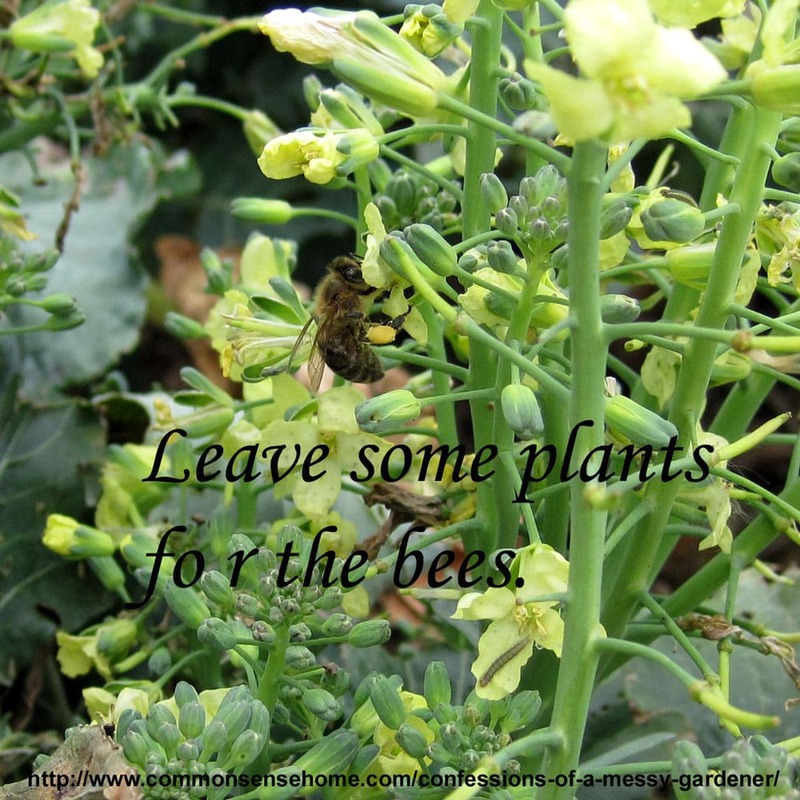 Update: November 11, 2012 – I was out picking some broccoli today, and I noticed the plants I had let go to flower were humming with bees. 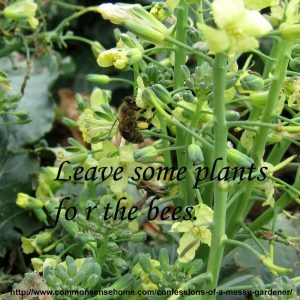 In fall, I always let some of my brassicas go to flower, as they are tough and will survive frost. That way, the bees always have some nectar until hard winter sets in. I just spent two or more hours mowing, clearing, cleaning up winter debris, and checking out some fallen logs in the “back 40” to become edges on the next raised bed which needs to go in for tomatoes and cukes this week. Luckily, we get free composted soil from the dump (you should see the red wigglers that are in that stuff! HUGE!) and hubby has a backhoe, so he goes over every Wednesday it isn’t pouring rain, and picks up one or two or three scoopfulls of the stuff. I have two more raised beds to put in, plus the strawberry bed, so I need lots of the compost. I currently have two log raised beds about six inches or so high, and one is 10×3 ft and the other is 8×3 ft. I also have two tractor-tire raised beds, which are about 20 sq ft each (I gridded them out as square foot garden beds, along with the other two). They’re doing incredibly well. They were half filled with twigs and punky birch we couldn’t burn, and lots of leaves, then the compost went on top of that, then a small bag of good quality growing soil with a bit of organic fertilizer in it. I have beets, carrots, peas, beans, cabbage, green onions, broccoli, radishes, lettuce, spinach, sage, thyme, oregano, 2 kids of basil, parsley, and sunflowers planted so far. I had tomato starts but… most of them didn’t make it. I’m bummed. I’ll buy some starts from the local farm, where I know the people and their growing methods (let’s just say “Roundup” is a naughty swear word in my neck of the woods). My cukes need to go in this week, too. And I’m making potato towers, and they need to be constructed and loaded up as well. Whew. I’m really tired! Holy smokes – you’ve got a few “little projects” going on. 😉 It sounds like you’re building a wonderful garden area. Love the attitude! I used to be sooooo freaked out about the weeds, now I have an attitude much similiar to yours. The weeds in the garden are first to go, by the time I have them under control you should see the weeds in my flower beds. The two by the front door are really BAD! I’m planning on working on them today and tomorrow. I think I need to smother them though and lay new mulch on top. No garden for me this year. 🙁 We will be moving sometime this summer so I didn’t want to go to the trouble (and expense) of getting it started only to have to leave it behind. I do have rosemary, chives, mint and strangely enough, a yellow bell pepper that is still going strong from last year. I never got around to pulling it. It managed to survive the winter with no care at all. There are 4 peppers on it right now that will be ready soon! Hopefully you have access to good farmers markets in your area. I keep wondering if we’re going to have to move, too, because my husband can’t find a local job and it’s tough to be apart all week. It’s the surprises I love best in not tending an immaculate garden. (and fluffing out my salads with lambs quarters, dandelion and mallow). Yup. I just discovered some volunteer strawberry spinach in a flower pot near the house. I could have written this fabulous article, myself, except I’m just a few weeds short of being as cool as you. But I can aspire! THANK you for sharing. lol – give it time and little water and sunshine, and you’ll be there! I can confirm again that none of you are crazy at all 🙂 If anyone’s crazy, it’s the people with nothing but lawn in their “gardens”. People sure do spend a lot of time, money and chemicals on something that just sits there.